Amendment: I have had a few e-mails about my sloper. I made a full set of dress, sleeve and pants slopers in a day-long class with Maria Martin. Details found here. 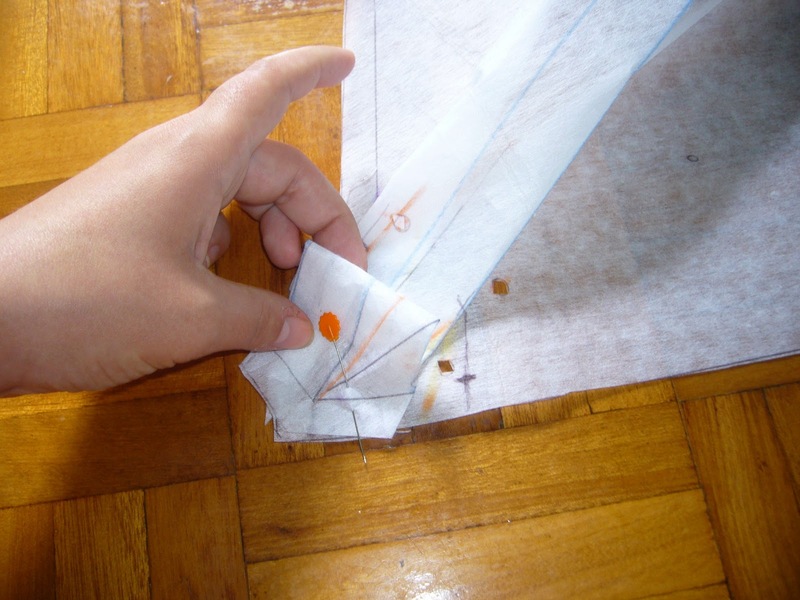 It changed the way I make clothes and was not difficult. 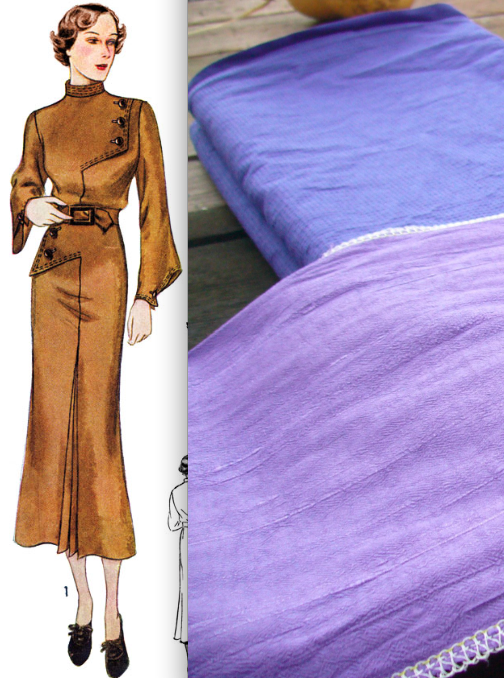 Wearing History’s Moderne, View 1, to be made with cotton pique and silk accents dyed with lilac iDye. 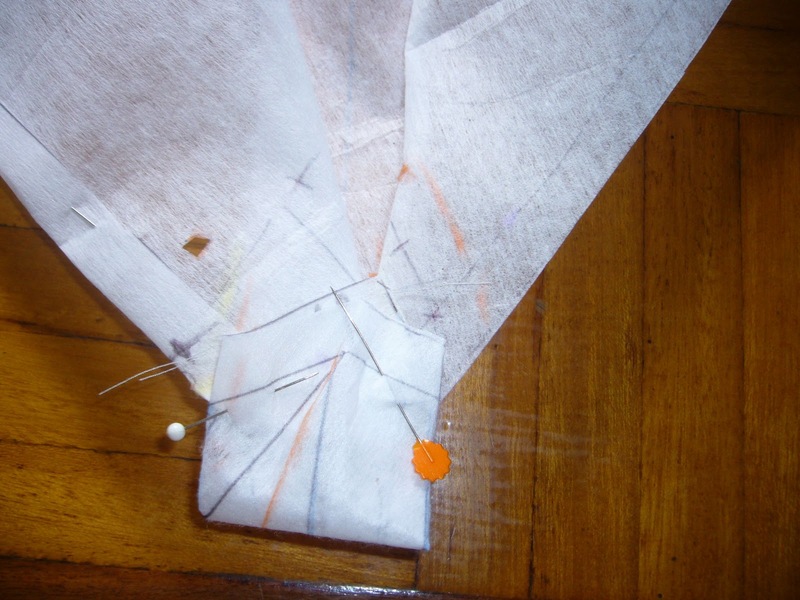 I want to use the lighter silk for bound buttonholes, covered buttons, and inverted pleats. This dress has already provided quite a ride- excitement over earning a free pattern as a tester, then fear as I contemplated fitting a high-necked, asymmetrical bodice. This dress shouts “Art Deco,” which is the point, though aggressively vintage styles can be hard to “pull off” without looking costumey. 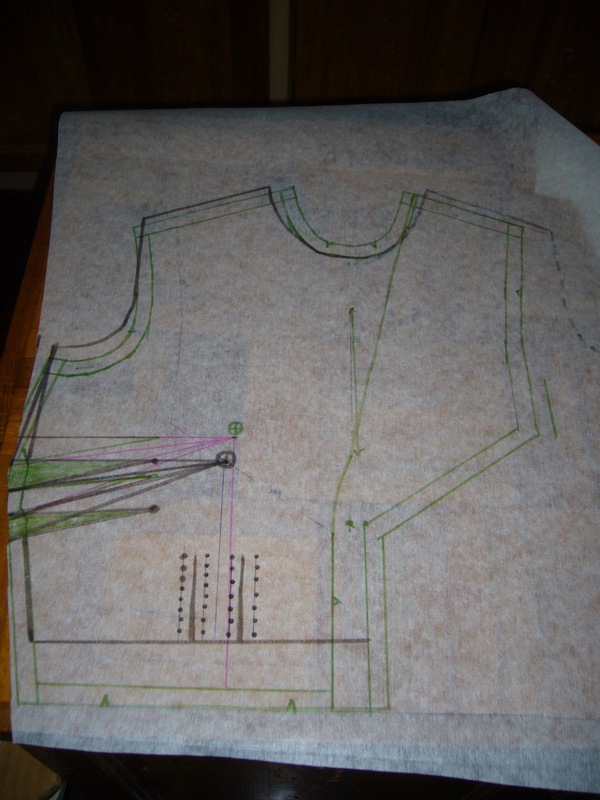 After working with the pattern I think it will be flattering and fun to wear as clothing, not a costume. 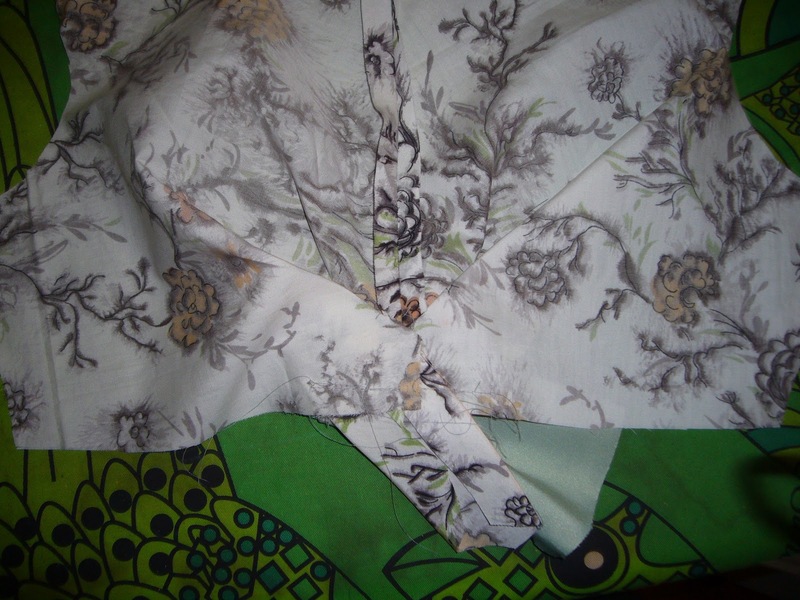 I knew that the CB would the be same for both pieces, and decided to line up the neckline at the CB. From there, I made my adjustments. I’m usually shorter through the waist in most patterns, and have found 1930’s shoulders/sleeves problematic in the past. I think the waistline curve downwards to the side seam is meant to provide a blouse-y effect along with the gathering. Experience tells me I don’t care for the 30’s/early 40’s blouse effect on my dresses and I edit it out when I can. I read (perhaps in Paris Frocks At Home) that women who can’t afford proper fitting are helped out by the blouse-y effect, as they can wear a belt. I like a smooth line at my waist. 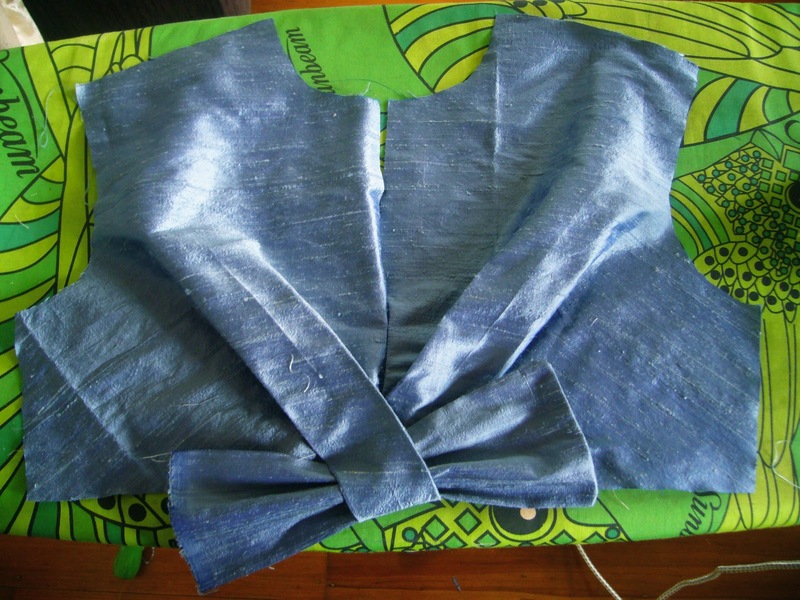 Not yet keen to tackle the front bodice, I worked on the back skirt. This dress has a raised neckline, 19″ (48cm) from the top of the neck to my waist. I used a Golden Section calculation to find the optimal skirt length by solving for A: 48(1.618)= 78cm. 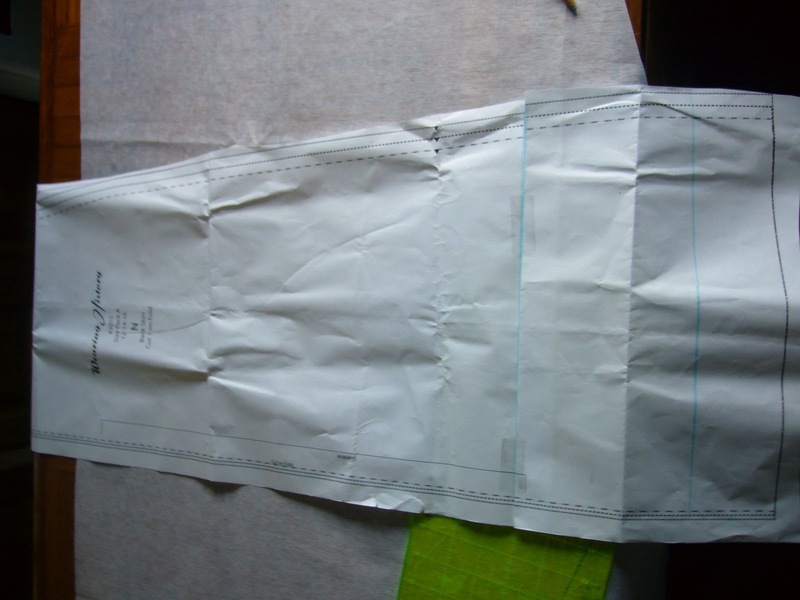 I made the skirt 78cm after hemming, which I adjusted on the paper pattern before tracing. The top is a little different but not alarmingly so. I have a high round side hip (also called muffin tops). It’s better to fit it than fight it. 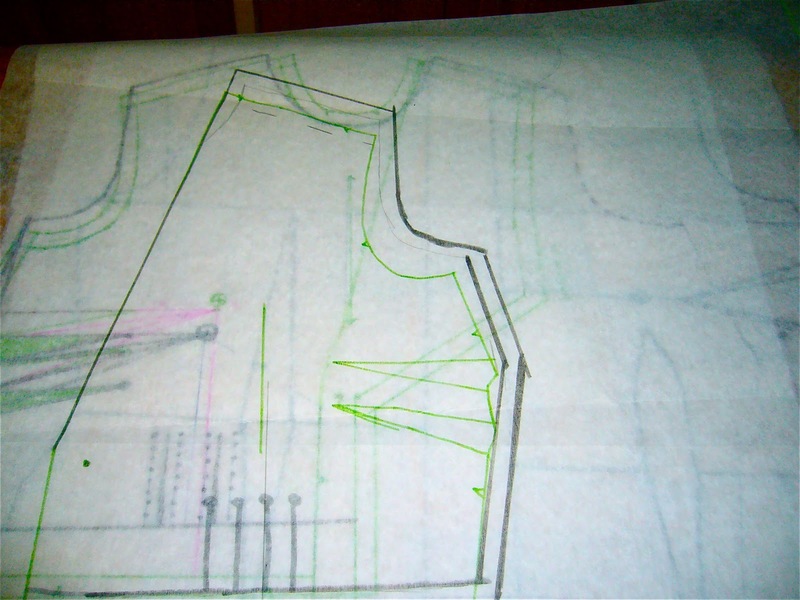 I traced the right front bodice off in green and did some funny stuff to find out the angles of the darts which proved pointless in the end because I kept the original darts. 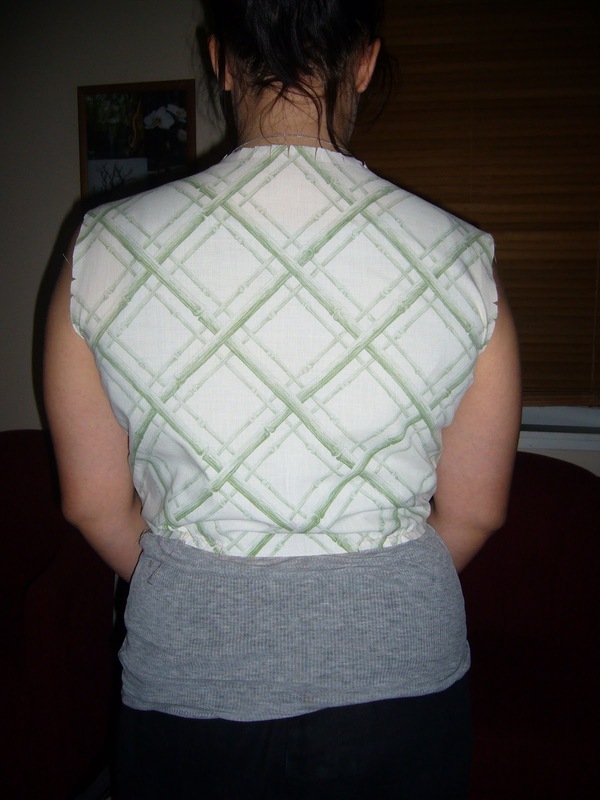 I laid the RF bodice on top of my sloper, matching CF lines and the bottom of the neckline. 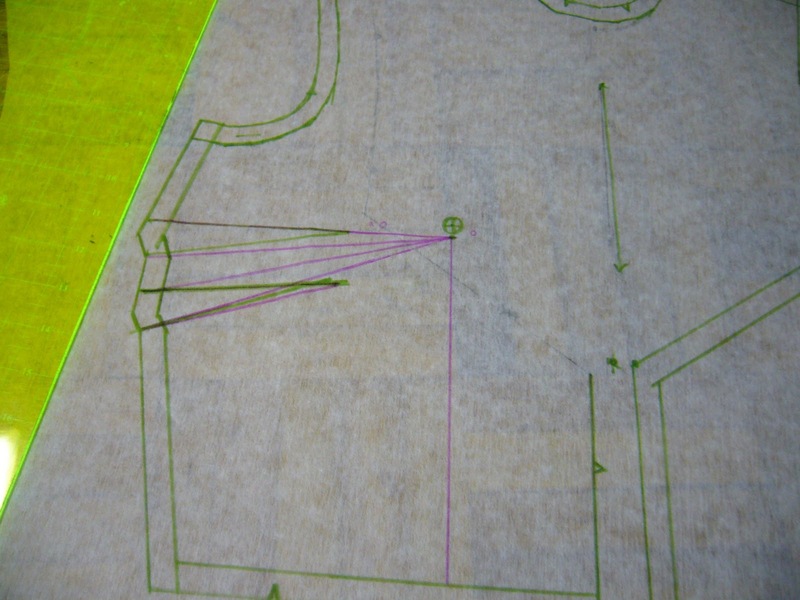 I had to be careful because the sloper has no seam allowances and the pattern does. Once I had it aligned, I re-drew part of the neckline, shoulder, armscythe. I (eventually) left the darts and the side seam as intended by the original. 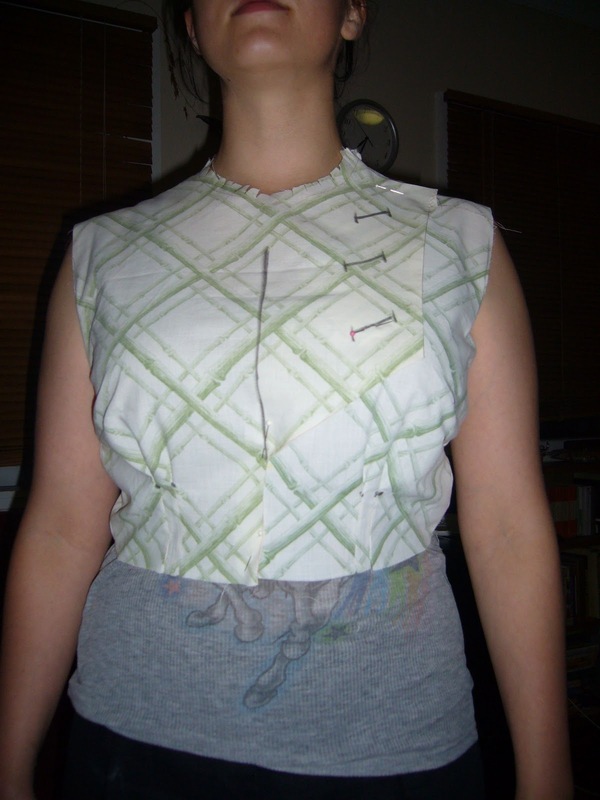 Rather than gathering under the bust (unflattering), I divided the dart and made tucks. I adjusted the left front bodice similarly. Funny, I always used to assume my bust caused all the headaches when fitting a 1930’s blouse or dress, but I think it’s actually my back and the shape of my shoulder as those are the areas I most had to alter. The front skirt pieces and facings needed no adjustment. I did change the sleeve cap a little bit, but I find it very interesting that I only needed to adjust the cap, which smoothly flowed into the underarm seam. I may need to change the collar, when I tried to attach it to the muslin it was several inchest too short. I don’t like the pouf around the bust, which I think might be part of the original design but doesn’t work with my body shape. I plan to tweak in the two side darts slightly for a smooth but not tight fit. Back is ok, I think it has a little residual blousiness, side is well-shaped. I feel confident enough with this muslin to crack into the real thing. I’d appreciate any constructive criticism, I know there’s some smart cookies reading this! 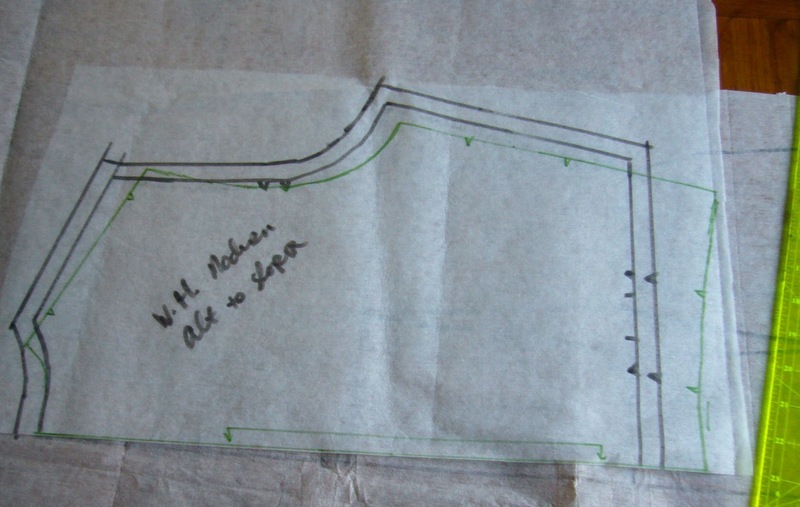 Also working on myWW2 Jacket pattern as per Sherry’s instructions, nothing to show you yet. I take back all previous aspersions cast against sartorial bows. I fought too hard for this one. 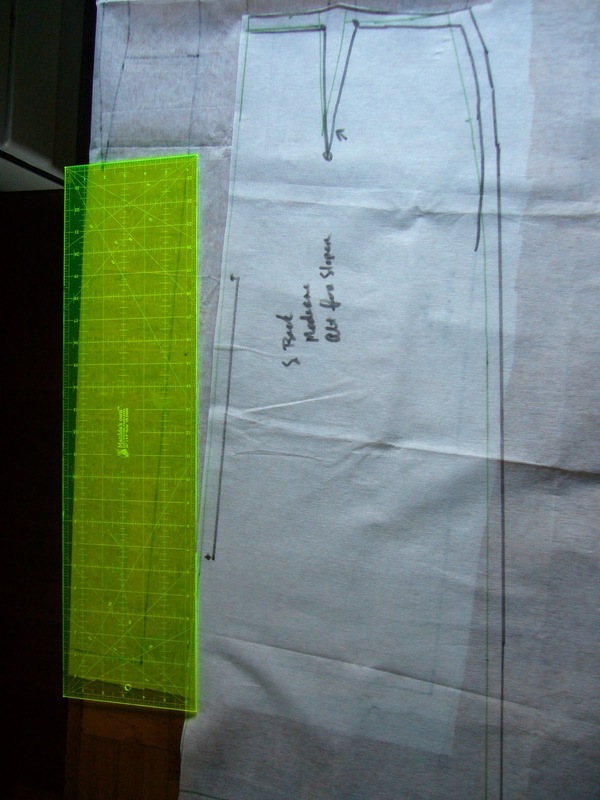 The original pattern, I dared hope not to need a fba. No such luck. This muslin worked out. 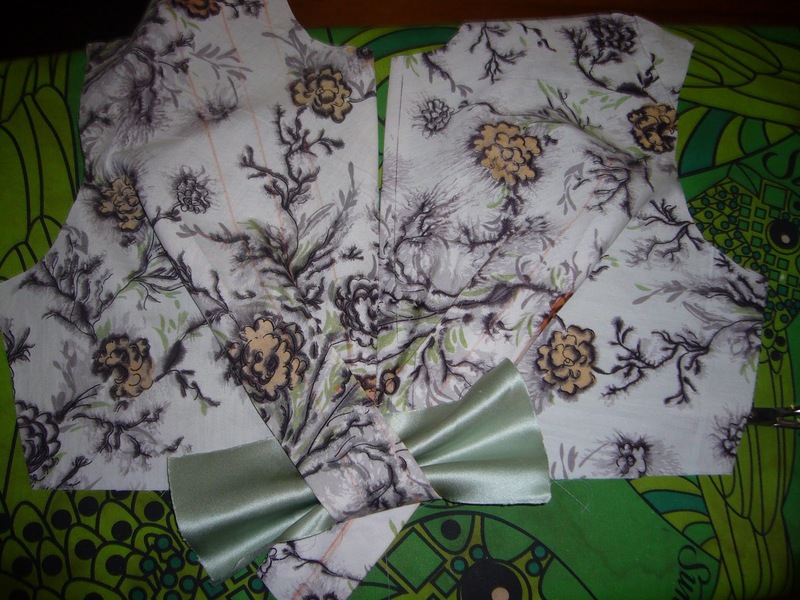 I played with it all afternoon, then we (the bow and I) felt I should sew something that didn’t require all of my concentration. By that I mean I was sick of sewing while wearing my girdle. Picked up the pleated bodice in the morning over coffee. 5524 is too cool for me to walk away defeated. I treasure the time I have to pour into a project like this. 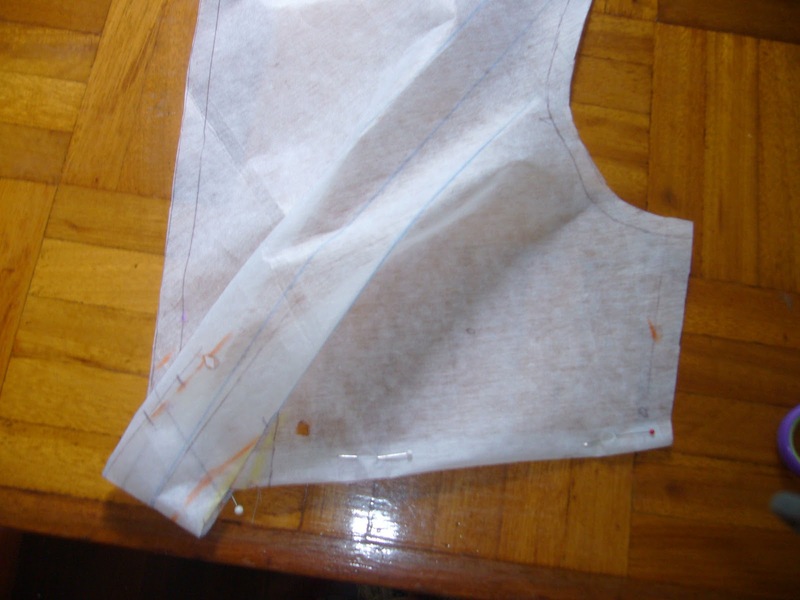 In my usual sewing time, this would take a week or longer and I would probably set it aside for simpler sewing. She was lovely by lunch. I have no qualms about wearing this bow on my bust. 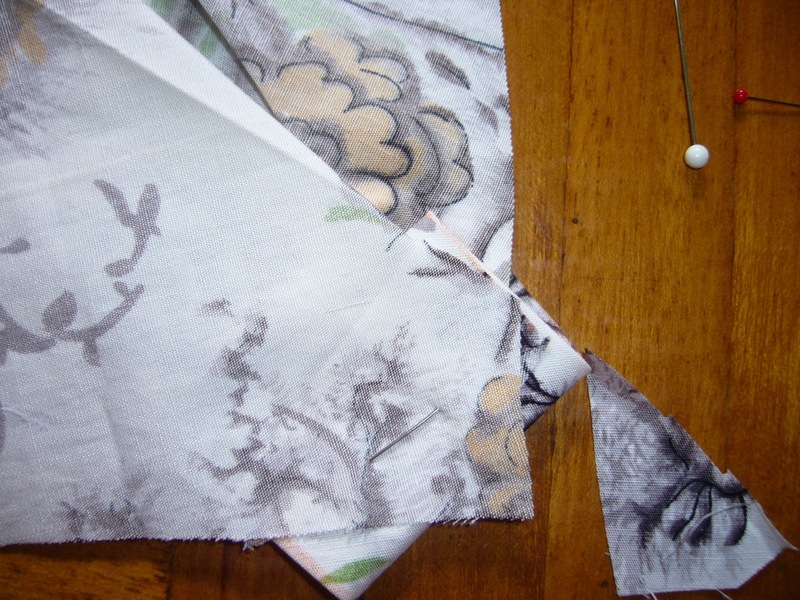 I feel I’m working on something exciting- a pretty dress. 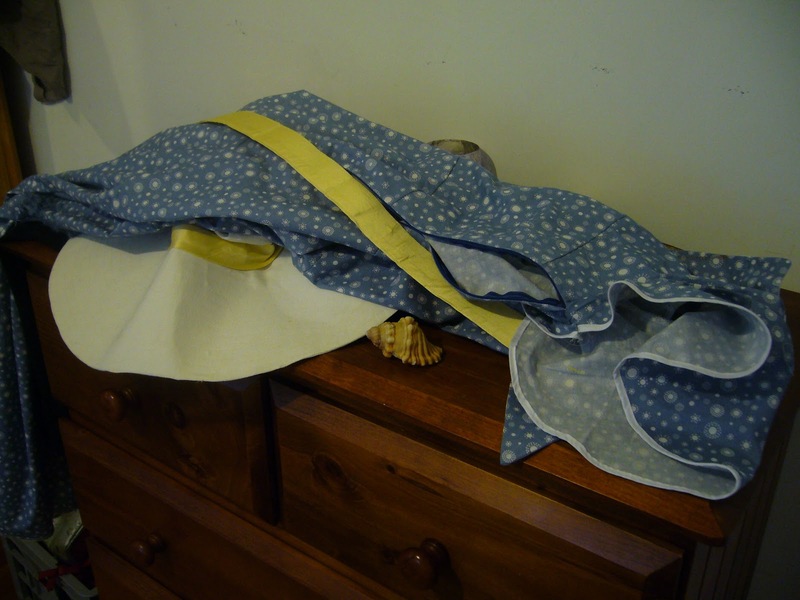 I haven’t felt this way since I used to make Elizabethan and Edwardian knock-offs in cheap fabrics as a teenager. Lounging Pajamas, made on my break. The cloud cover outside (unseasonably chilly and delightful) makes for bad photographs, I’ll post some soon.